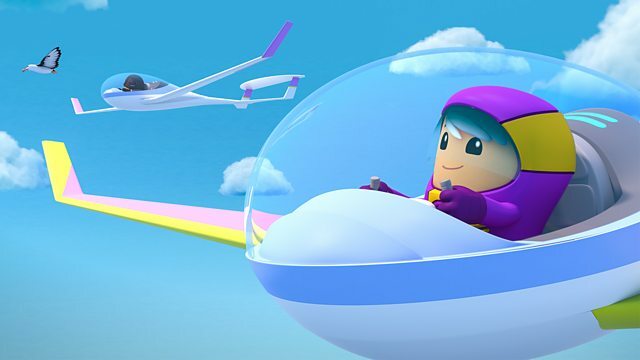 Meet the Go Jetters, four explorers on a global adventure! Glitch gatecrashes an academy gliding test, causing calamity in the skies over Argentina. Browse content similar to Gliding, Argentina. Check below for episodes and series from the same categories and more! they are the Go Jetters. Coordinates set for Tandil in Argentina. Sunny and lots of thermals. Now fly to the end of the valley to pass your academy gliding test. But I still don't get how gliders fly without an engine. Gliders use thermals to rise up in the air. -And they have a special design, too. Right, Ubercorn? Let me tell you more with some funky facts. Hit it! Let me tell you about the place we're at. and rises to make a thermal. its wide-open plains make this location a great place to glide. Gliders are very light with long wings and no engine. lift them higher and higher. and warm thermals are often found beneath them. Glider pilots look out for these clouds to help them fly. Cumulus clouds ahead, cadets. Let's ride those thermals beneath them. Steer slightly to the right. Good job. Just follow that albatross. She knows where the thermals are. Gliding's so quiet, Lars. So peaceful. -Lovely morning for a race, No Jetter. This is no race, Glitch. It's an academy test. It's a race if I say it is and I'm going to win. Isn't that not just your grimbler, Glitch? And give us more space. See you at the finish, No Jetter. Not cool. That's not gliding. Ha-ha! I'm winning, Grimbots. I'm winning. Is my finish line ready? Oh, what a spectacular moustache. -Not good. The gliders are missing the thermals? They'll crash to the ground. And Glitch is in trouble, too. -You need to clear those skies, Go Jetters. Ubercorn, we need to clear the sky. And stop the gliders from crashing. You got it, Go Jetters. Time for a mix to fix that Glitch. Out of the way Grandmaster balloons. Great work, team. Now where's Glitch? I'm sure to beat those No Jetters. Oh, only one shot at this, Foz. G-O Force, go, go, go! Go Jet Academy gliding test complete. But I don't think Glitch is in a hurry to go gliding again. Huh? Oh, yes, I did come fourth. Get rid of these wings, Grimbots. Time for a glider selfie. maybe one day we'll be zooming through the clouds above you.